It may be a disgusting subject for some, but the sight of brown mucus is a common occurrence with colds and infections. 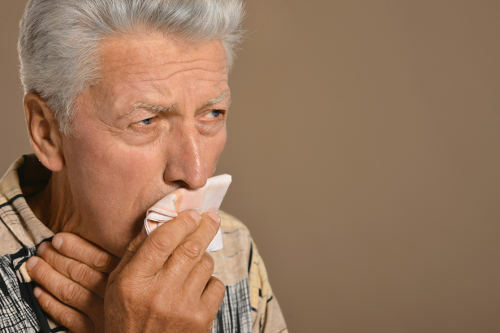 It is important to know when coughing up brown mucus is normal and when it is a sign of a serious health complication that requires attention. Learn about the brown phlegm we all experience from time to time and natural treatments for any type of brown mucus discharge. Tissues in our body produce mucus to protect the linings of our nose, sinus, mouth, throat, lungs, and gastrointestinal tract. These regions need to be moisturized to avoid becoming dry and leading to problems with their perspective functions. Our mucus also prevents environmental debris and bacteria from making their way deep into our body. Depending on the cause, mucus can appear clear, green, yellow, and even brown. Brown mucus may indicate you have more than just a viral infection. Our body is constantly producing mucus at a rate of one to 1.5 liters each day, according to Mayo Clinic. When the mucus becomes thick or discolored, we need to take a look at the possible cause. The color and consistency of your mucus can easily change based on what you eat and drink throughout the day. Foods such as chocolate and garlic can add a brown hue to mucus coughed up as can drinks such as tea, coffee, dark sodas, and wine. As with other dark-colored drinks, some alcoholic beverages will also turn your phlegm brown. Using alcohol excessively makes you more prone to respiratory infections, which can also result in brown mucus. This can be a sign of serious throat and lung infections as well. If you are a smoker, you may see brown mucus on a regular basis from the tar, resins, and chemicals in a cigarette or cigar. This is obvious with chewing tobacco products. These dangerous chemicals will build up over time in your lungs and throat, and your body responds by coughing to rid itself of the substances. Many smokers produce brown phlegm in the mornings upon wakening. In chain smokers, the body cannot keep up with this process, and the lungs and airway passages become clogged with mucus. Chronic bronchitis and emphysema may set in. Despite your best efforts to avoid the overproduction of mucus, environmental surroundings may be to blame. Living or working in a region with high pollution rates puts you at risk for brown mucus discharge simply by breathing in toxic fumes on a daily basis. This can also happen when cleaning a dust-filled room. Brown mucus caused by nasal polyps is the result of dried blood being expelled. These polyps can be present in your sinuses and nose cavities. As mentioned under the tobacco section, lung infections such as bronchitis and emphysema can cause your mucus to be brown in color. This is true with lung cancer as well. If you are coughing up brown mucus on a regular basis with no explanation for cause, you may need to seek medical advice. Acid reflux can also be a common cause. This indigestion issue can also present brown mucus in your bowel production, which may be a symptom of irritable bowel disease. Depending on the cause and whether you have brown mucus from the throat region or brown mucus from your nose, there are medications your physician may suggest to help with the discharge. Medications that fight phlegm and the irritating cough that accompanies mucus buildup include decongestants, cough suppressants, lozenges, antihistamines, and nasal sprays. There are several home remedies used to treat mucus buildup not caused by a serious health condition. You can try the common remedies of blowing your nose, drinking plenty of water, and inhaling steam. If these tricks do not suffice, you can use common kitchen ingredients, alone or together, to tackle the mucus. Add one teaspoon of table salt or sea salt to a glass of warm water. Try not to swallow the water as you gargle the solution for a few minutes. Repeat process as needed. The properties of pepper, white and cayenne, stimulate the body to release the buildup of mucus. Eat a spoonful of one teaspoon of honey and ½ teaspoon of white pepper grounds combined. Repeat three times a day for a one-week period. Another good remedy is to mix one teaspoon each of grated ginger, cayenne pepper, and apple cider vinegar with three teaspoons of honey and eat four times a day until mucus is clear. Soothe your throat and loosen mucus with a warm tea. For best results, add one teaspoon of honey and one teaspoon of lemon juice to a cup of hot water. Remove toxins that create brown mucus by combining the juice of a fresh lemon with a small ground onion. Heat the two in a cup of water and boil for three minutes. Add one tablespoon of honey and drink three times a day until mucus clears. Get the best of the herb’s anti-inflammatory properties when you mix garlic and lime together. Boil one cup of water with the juice of four lemons and two ground garlic cloves. Add ½ teaspoon of powdered black pepper and a pinch of salt before drinking. You can also use garlic cloves with a glass of milk. Ginger is said to be a natural cough suppressant. Mix 100 grams of crushed ginger root and two teaspoons of honey and warm the blend. Swallow two teaspoons of the mixture two times each day for three days. Using its sulfur component, shallots may help fight infections and the accompanying mucus buildup. Munch on eight peeled shallots with sugar until you experience a burning sensation as this is a sign it is working. Turmeric may work as a natural antibiotic to tackle phlegm. Mix one teaspoon of turmeric, one teaspoon of black pepper, and one teaspoon of honey into a glass of heated milk. Another healing solution is drinking a teaspoon of apple cider vinegar with two teaspoons of turmeric powder. Create a bay leaf tea with one cup of water and a handful of fresh bay leaves. Bring to a boil and allow the tea to steep for a few minutes before removing the leaves. You could also add crushed black pepper, one teaspoon of crushed ginger, and one teaspoon of honey to the water before boiling. To further prevent mucus buildup, there are a few things to keep in mind and incorporate into your lifestyle. Avoid tobacco products or second-hand smoke. Limit or avoid dairy products and fried and refined foods. Try not to swallow the spewed-up phlegm. Avoid inhaling chemical fumes such as paint fumes and household cleaners. The body’s production of mucus is vital to the smooth functioning and protection of the membranes of our nose, throat, mouth, sinus, lungs, and gastrointestinal tract. When we have an excessive amount of mucus caused by illness or our environment, we may notice a brown coloring to our phlegm. Even the foods and drinks we enjoy daily can affect the coloring. It is wise to note any changes in the consistency of our mucus, as well. Many cases of coughing up or expelling brown mucus can be treated by using remedies found in our kitchen. Brown mucus that cannot be explained or treated at home may need professional medical advice. “Coughing Up Brown Mucus or Thick Dark Brown Phlegm Causes, Treatment,” Treat, Cure Fast; http://www.treatcurefast.com/nose/cough/coughing-up-brown-mucus-phlegm/, last accessed March 13, 2017. Watson, S., “The Truth About Mucus,” Web MD; http://www.webmd.com/allergies/features/the-truth-about-mucus#1, last accessed March 13, 2017.